Since December 1998, Lightsounds Sydney City located in Darlinghurst has been servicing Sydney's nightclub and bar scene and its location is right in the hub of it all. Right next to Sydney's CBD, this store is central to many areas. 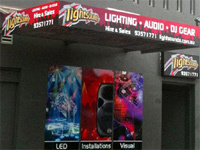 Lighting Sydney features a fully stocked showroom with 100% blackout for incredible lighting product demonstrations. The store holds plenty of stock – especially all those last minute needs like fluids for your effects machines. The hire department has everything needed for a wide range of parties and events. The store also holds a professional DJ practice booth that can be rented on an hourly basis. Thanks for your attentive help in getting my gear sorted on a regular basis, see you soon! ust a quick note to thank you and Lightsounds for your outstanding service recently with the Australian Film Premier for Monsters Vs Aliens By DreamWorks Animation….The event was a great success and your special service was truly appreciated. I look forward to working with you and Lightsounds in planning future special effects. Thanks for all your help, the equipment was awesome! We'll be back early December! Quick note to say a great big thank you to Lightsounds for helping with my daughters 14th birthday party. The guys at the Darlinghurst store me that exceptional customer services is still alive and kicking by taking my limited budget (and limited imagination) and worked out the best lighting combination for my solution, Brett the Manager, really took the time to listen to what I wanted and helped construct a package for me. The result was fantastic and really made the party one to remember. On behalf of my daughter, and her 50 friends, a big thanks Lightsounds. You guys have been very supportive for providing training and technical operations to our staff and students at Brisbane Water Secondary College and to our Technical Entertainment Production Academy (TEPA) students enabling our students valuable and real hands on insight into the live entertainment industry. You have also provided training in technical and DJ operations as well as assisting in the training and support to BWSC staff.